Old wooden frame of a barn. In nature, the process of growth and decay is allowed to pr oceed unbridled. Wood develops in tune with this cycle of life. In its first life cycle, a tree stands tall and grows in the forest. In its second, it is felled to build a structure, offering man protection from the elements under its weighty be ams. 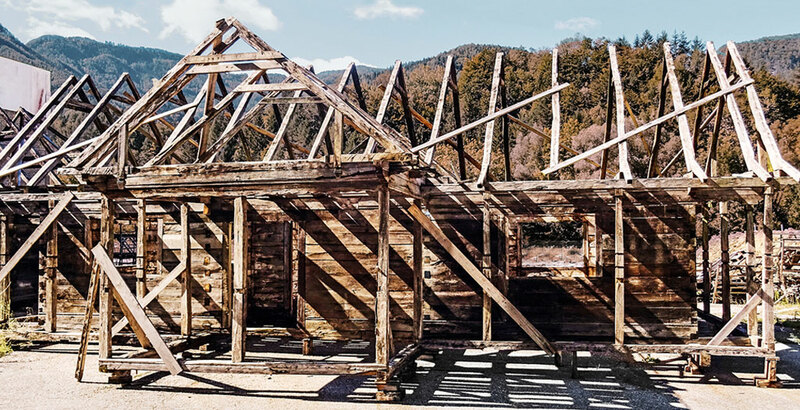 When a building is no longer required, wood can then enter a third cycle of life — as the new centrepiece of a household. 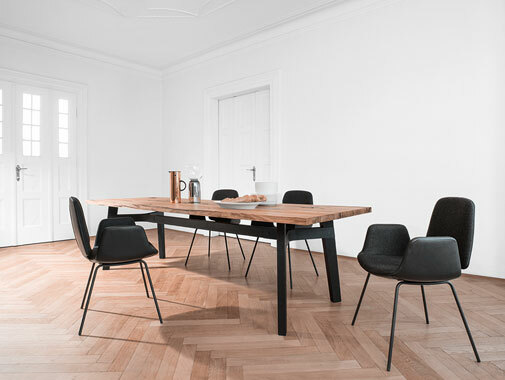 Janua breathes new life into old wood, repurposing vintage oak with a contemporary function. 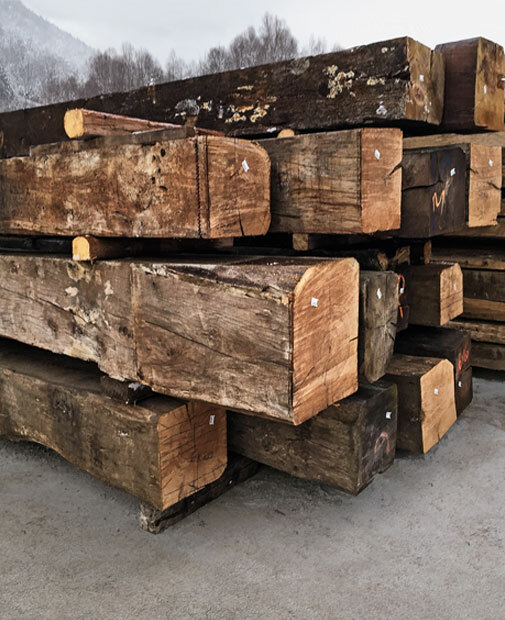 The third life cycle - Vintage oak given a new lease of life by Janua. Janua transforms used oak planks from disused barns into furniture which oozes character. Cracks, pegs and worm-holes are all confidentially left to tell their story. This earthy quality only serves to reinforce the uthentic overall impression – elegance with contempor ary chic and technical mastery.The novel lightness of this approach supplants the weighty solidity exuded by the oak furniture of the past, resulting in a look more reminiscent of a strippedback Zen style than traditional wood-panelled walls and rustic alpine chalets. Janua works with nature – and creates new surfaces with its vagaries. 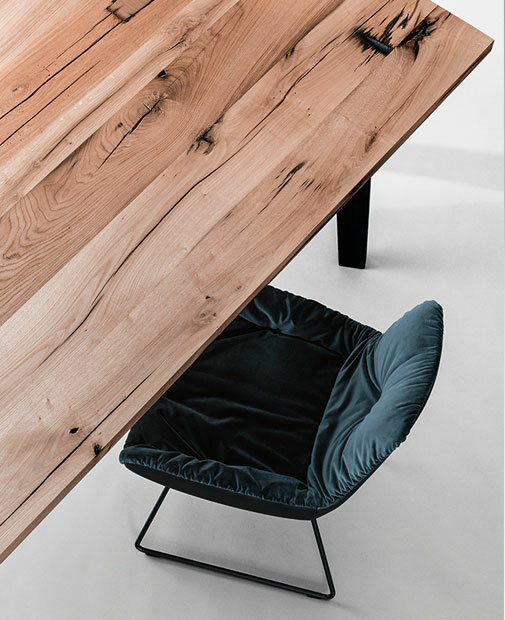 Living around wood has been back in vogue for some time – and the practice of combining different solid wood elements is more up-to-date than ever. Janua offers solutions made exclusively with solid wood as well as smart ombinations with other materials and surfaces. Take, for instance, the undeniably classy look and feel of a table with steel legs and a solid oak tabletop – ideally one featuring an eye-catching finish. Perhaps vintage oak with an especially handcrafted feel – something which every piece of Janua furniture guarantees as standard. Vintage wood is a great option for adding even more Janua character, and it is available in three fascinating finishes. 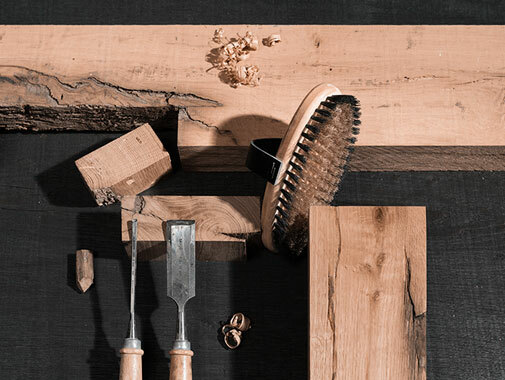 Using pliers, a mallet and chisel, the vintage wood is carefully prepared by hand until an unmistakable aesthetic and texture is achieved. This finish is all about the look and feel, and simply cries out to be touched. The inherent energy of the wood is tangible, and creatively channelled to connect with our emotions.